Night sky photographer Mike Hankey of Freeland, Md., captured this dazzling Leonid meteor on Nov. 17, 2012, during the peak of the annual Leonid meteor shower. The annual Leonid meteor shower may create some striking flashes overnight tonight (Nov. 16) and early Tuesday (Nov. 20), and you can watch the celestial fireworks show live via a NASA webcast. While the meteor shower reached its peak on Saturday, Nov. 17, the Earth is passing through another lane of debris from the parent comet of the shooting star display. The meteor shower will be at its best before dawn on Saturday, at about 3 a.m. EST (0800 GMT), scientists say. The Leonid meteor shower is created by dusty debris from the comet Tempel-Tuttle, which orbits the sun once every 33 years. Each November, the Earth plows through the comet's debris stream to create amazing meteor displays. This year, NASA scientists predict the Leonids may be seen at a rate of 20 to 30 meteors per hour over the Americas, weather permitting. It is vital to pick an observing spot far from city lights to obtain the best views. 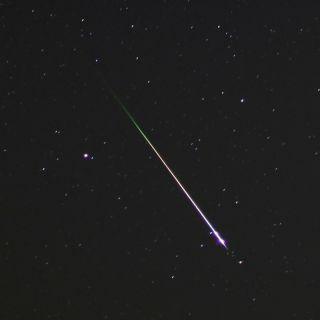 Editor's note: If you and snap an amazing photo of the Leonid meteor shower and would like to share it with SPACE.com for a possible story or image gallery, send images, comments and location information to managing editor Tariq Malik at tmalik@space.com.